Everyone loves a good summer. The smell of freshly cut grass, the fact that everybody moans about getting sunburnt but secretly likes it, and of course, the privilege of being able to garden away to the heart's content. Well who says summer has to end? At least when it comes to the gardening bit. Yep, bursting on to the scene is a new food invention from the mind of Jim Ruck which goes by the rather snazzy name Breathe. 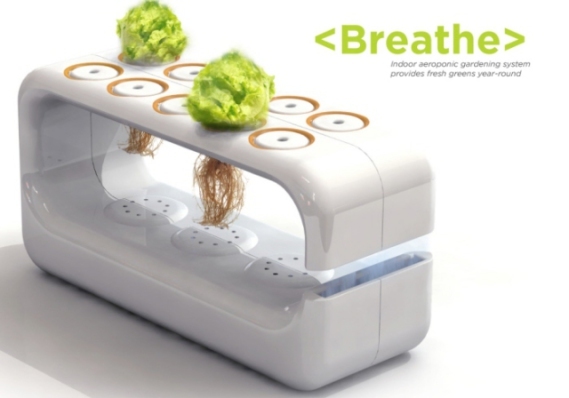 Breathe is a modern, green and very much indoor take on gardening. The portable device is extremely convenient, with its sleek outer appearance helping it to fit nicely with any surrounding living space. 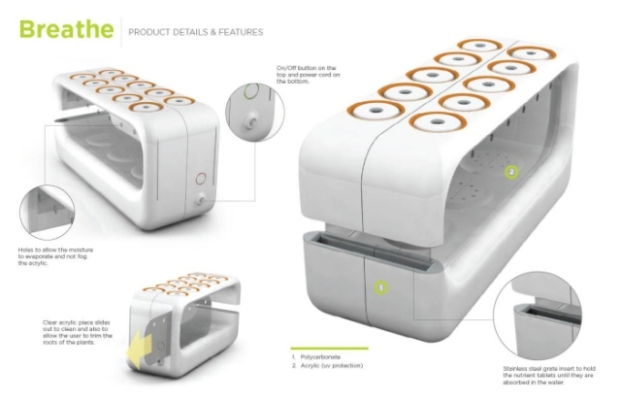 Designed to modernize the upkeep of plants and vegetables, users can forget about having to take care of their indoor greenery and can also grow a greater range of produce in their homes thanks to the host of nutrients provided by Breathe. Breathe works with the aid of an inbuilt pump which keeps water flowing around the machine. Whilst the pump is doing its thing and keeping the plants hydrated, misters, sat beneath the plants, spray nutrients up on to the roots of the plants, allowing for optimal growth conditions. Special timers are also utilized so as the spray is released at specific intervals. In addition to the inner mechanisms of this crazy yet innovative food invention, backup batteries are also present just in case the power is cut. Put this together with a sliding and easily removable acrylic piece which reminds users to clean it and also to trim the roots of the plants, and what you have is a remarkable bit of gardening kit. The Breath product seems like a very easy to use and portable device, and with a water top-up every couple of weeks one of the only tasks which a user must undertake, it is also a bit of a time saver. Yep there are a number of benefits offered up by Breathe, particularly if you want to get picky about it. For housekeeping clean freaks, Breathe's 'I don't need you' attitude towards soil could be a real crowd pleaser. Indeed, if you can get used the pretty bizarre sight of roots hanging in mid air but still growing, then soil will certainly not be missed. 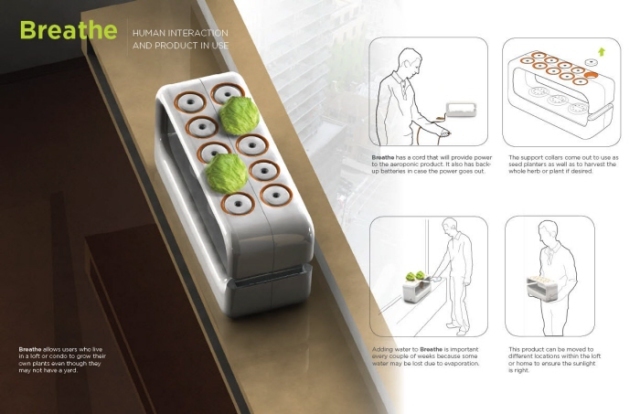 Although this product means that people will not have to constantly remember to water their plants, or remind neighbors to do it, the question must be asked; is it really worth it? After all, the Breathe device must still be moved to areas of the house where there is sunlight. With this said however, it is Breathe's soil-less and low maintenance qualities which could truly make it a cherished household product, not to mention making the prospect of growing vegetables during winter less daunting, which can only be a good thing. Despite featuring in a variety of notable magazines, Breathe has not yet hit the market, meaning that any gardeners chomping at the bit will have to wait to get their hands on this product. In the meantime, there is certainly no harm in asking the question, what would you grow? Time To Say Amen For Ramen!